Buenos Aires is the perfect cycling town. Wide streets, flat as pancake, and great weather year-round. There are some but not tons of people on bikes here and the city has installed some bike-only lanes and a nice path that connects a major swath of the city. Strangely, not as many people ride as you may think. Many of those that do ride, use a very simple, single-speed beach cruiser type bikes cost a little less than $100 U.S. They are perfect for this city. Most Argentineans I speak to here say that cycling is so dangerous and that the drivers are too careless and there’s just too much traffic. But I have found that the traffic here is no worse than in any other major city in the world including Chicago, New York, Paris, or Rome and cycling here has been great. I’m a much safer cyclist than car driver anyway so I may have a warped perspective. 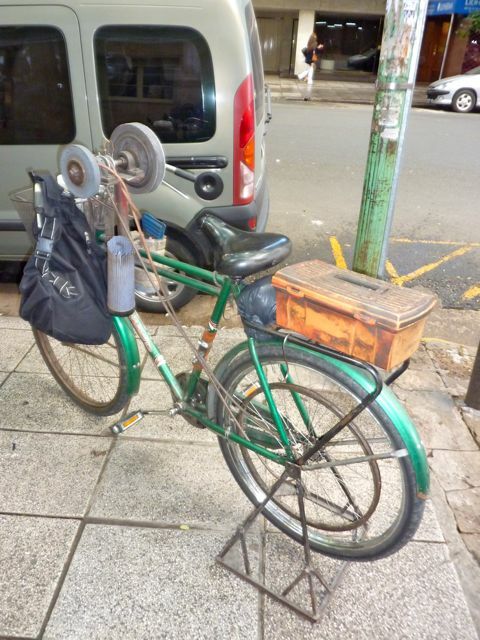 There are quite a few delivery cycles here that are used by pizza parlors and grocery stores. I also saw a couple of old guys on cool old bikes with grinding wheels attached to the frame. They have traveling knife and scissor sharpening businesses. They stop and put the bike up on a stand that elevates the rear wheel so they can pedal the bike in place like an exerciser, and then use a belt that goes from the grinding wheel to a flywheel on the back wheel to power the grinder. I was told that years ago, these guys had a particular song that they sang as they rode through a neighborhood that would let people know it was time to get their knives sharpened. Thankfully, I’ve been able to get in on the bike culture here as I bought a used big wheel unicycle ( 29” diameter wheel) when we were in Australia and carried it with us to New Zealand and onto Argentina. It’s smaller than the 36” wheel I ride in Michigan but it’s very easy to travel with and it’s still super fast (I can keep up with the average bike rider). 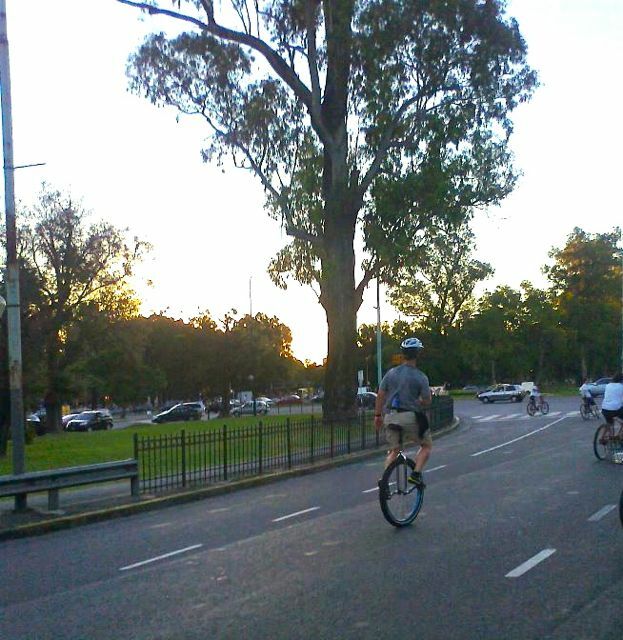 Our second day in Buenos Aires, I found that there was going to be a Critical Mass event. These happen all over the world, including in Detroit. It’s a grass-roots, quasi-anarchist movement not dissimilar to a flash-mob (a sort-of spontaneous but choreographed dance that manages to just happen in an unlikely public place with seemingly absolute strangers joining in) where at a set date and time, tons of people on bikes of all kinds gather and take to the roads forcing vehicular traffic to a standstill. I showed up on my big wheel at the Obelisk in Buenos Aires at 4PM on a beautiful Sunday afternoon. After an hour or so, a bunch of people began circling the Obelisk on their bikes. The group continued to grow and grow until several people branched off and began to ride away from the Obelisk with the rest of the group following. At this point there were probably over 500 cyclists. There was no set route but the group rode and rode and at each intersection, several participants would stop and hold off the oncoming traffic. There were times when taxi drivers became irate but for the most part, people were very cool. There were several places where the entire group stopped at huge intersections with large apartment buildings on either side. People were out on their balconies and the group began to chant, “AGUA, AGUA,” and suddenly buckets of water were raining down on the crowd of riders. It was awesome. I was a fairly normal sight compared to the long-curly haired man in rainbow unitard pulling a child-trailer with a fully- grown woman inside, or the guy on a bike that was probably 20 feet long. There was a guy with a cool old folding bike that was selling raffle tix for $$20 Pesos each and was planning to pick the winning raffle ticket at the end of the ride. I was the only unicycle and people really liked it. Everyone wanted to know where I was from and if it was hard to ride the unicycle which they call a monociclio. It was hugely energizing to ride through the streets with this mob of cyclists, see the city, and enjoy the pure joy of being outside and pedaling with others. I rode for more than two hours that day and the huge group was still going when I broke off to go home. I’ve ridden the big wheel around the city at other times too and to Spanish class. It’s been a great way to see things that we don’t see from the public bus or taxis. It’s also fun to see other people out on bikes and to talk to them. The streets and sidewalks are pretty good and it’s been a good challenge navigating the massive amounts of garbage and dog waste that accumulates here. 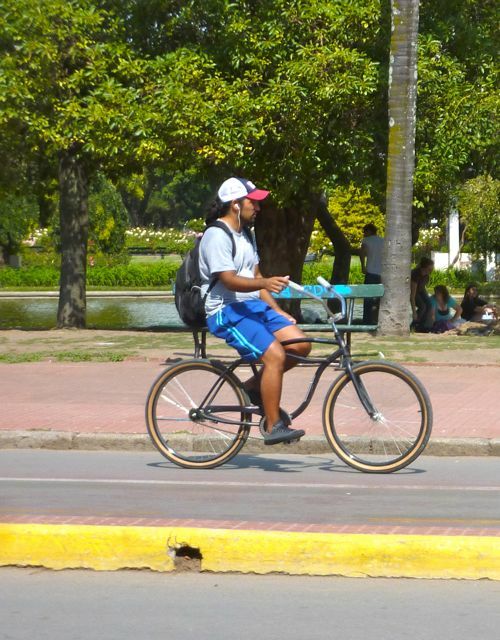 Buenos Aires has done what many other cities around the world have done by making bikes available to people all over the city so folks can get from one end of the city to the other by bike without actually having to own their own. Everywhere we have seen this program, there is a fee for the bikes but in Buenos Aires, it’s FREE, or gratis as they say here, for citizens of the city. The bikes are basic but perfect for getting around and it seems as though the program is well used. I hope that in 20 years I will come back to Buenos Aires and see a city with tons more bikes, and fewer cars, as it truly is the perfect cycling city. Click here to get an email each time there's a new post!